Jump into the holiday spirit with a collection of never-before-released holiday favorites all in one value-priced set, the Lifetime Holiday Triple Feature, arriving on DVD November 4 from Lionsgate Home Entertainment. 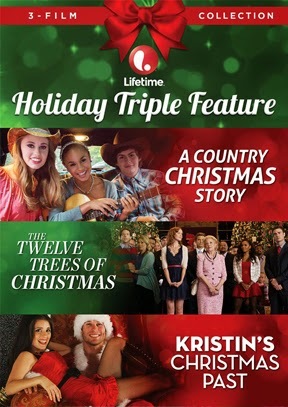 For years, Lifetime® has been synonymous with celebrated holiday programming and this DVD features three of their most popular offerings, each one with an impressive array of talent including A Country Christmas Story featuring Grammy Award®-winner Dolly Parton, Grammy Award®-nominee Brian McKnight and Desiree Ross (TV’s “Falling Skies”), Twelve Trees of Christmas starring Lindy Booth (Dawn of the Dead) and Melanie Brown (The Seat Filler) and Kristin’s Christmas Past featuring Shiri Appleby (Charlie Wilson’s War), Will Kemp (Step Up 2: The Streets), Elizabeth Mitchell (TV’s “Revolution”), Judd Nelson (St. Elmo’s Fire) and A. J. Langer (TV’s “Private Practice’). The perfect holiday gift, the Lifetime Holiday Triple Feature DVD. This delightful Christmas package of Lifetime Original Movies has everything you could ever wish for. In A Country Christmas Story, the film follows a young Appalachian mountain girl (Ross) who defies her mother to pursue her dream of becoming a country star; while in Twelve Trees of Christmas a local librarian (Booth) rallies her neighbors with a tree-decorating contest in order to save her library from a real estate developer’s plans of demolition. Finally, in Kristin’s Christmas Past, a smart, sassy, 34-year-old woman (Appleby) who is estranged from her family, goes to sleep alone on Christmas Eve, and wakes up Christmas morning 1996 only to relive the worst Christmas of her life. Luckily, this time she’s able to change not only her imperfect past, but also her less-than-perfect future.